First USA National team to ever win the Hong Kong 7s (2008). Earned first-ever USA Women's Professional Rugby player stipend/contract for 2009 World Cup training. Placed 3rd/4th in 1st ever 2009 Rugby World Cup Sevens in Dubai (no 3rd/4th place game played). Trained youth rugby players all over the world as part of National Team tour experiences and duties. Placed 5th in 2006 Rugby World Cup 15s in Edmonton, Canada. Scored 9th most all-time points (62x) for Team USA Women's 15s throughout career. Official Atlantis player #616 out of 1,369 total (for both men and women). Brazil (Niteroi) - 2002 (Won Championship). Bangkok - 2005 (Won Championship). Las Vegas - 2013 (Lost to National Canadian Maple Leafs in Cup Quarterfinals). Helped train first Brazilian Women's National Rugby Team and bring awareness of Women's Rugby Sevens to other underdeveloped global rugby regions as part of tour experiences and duties. Won 2011 Division I National Championship to propel team into WPL (scored all 23 points of final match). 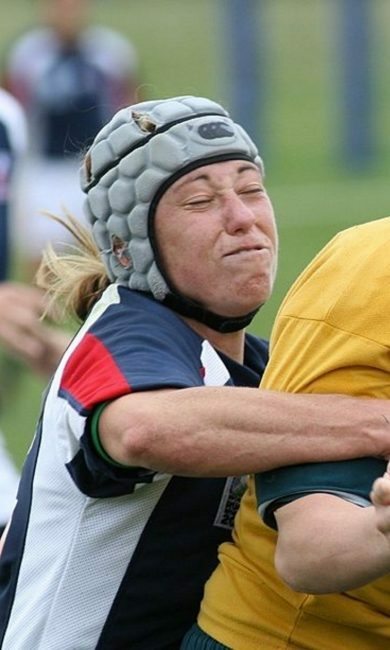 Rugby Magazine's 2011 Women's Rugby Play of the Year. Earned highest scorer and Team MVP in multiple years. Won National All-Star 15s Championship Series in 2002 and 2003; Runner-up in 2001 (+Tournament MVP). Won National All-Star 7s Championship Series in 2008; Runner-up in 2002, 2004, 2006 and 2007. Won every major regional 7s tournament in 2004; Las Vegas 7s, Cape Fear 7s, and Lakefront 7s.